The hotly-debated sale and development of Postal Station K, a historic art deco mail facility just north of Yonge and Eglinton, entered a new phase recently with the release of several detailed digital images and a clutch of statistics related to the planned residential addition to the multi-layered historic site. 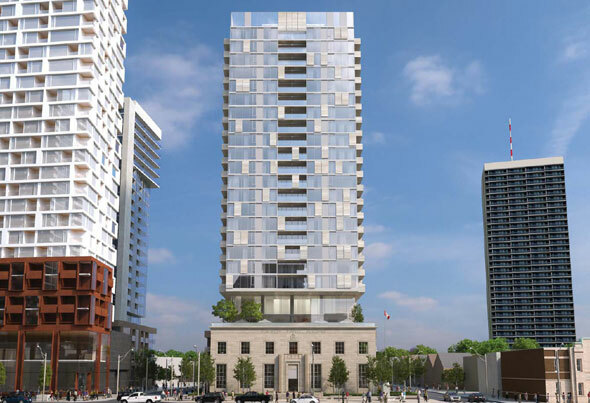 As envisioned by developers Rockport and RAW architects, a relatively modest 26-storey condo tower will rise from behind the federally protected Queenston limestone, granite, and brick structure with only a handful of minor alterations planned for the existing property. The two-storey art deco stone building is located on the site of Montgmery's Tavern, the focal point for a key battle during the early days of the town of York. It was here in 1837 a group of armed militants led by William Lyon Mackenzie, frustrated by the all-powerful rule of privileged British elites in Upper Canada, staged a futile last stand against loyalist troops. The postal building was built in 1936 and contains several unique features, among them the rare royal cypher "EVIIIR" inscribed above the door. Short for Edward VIII Rex, the dedication is particularly valuable as Edward was on the throne for just under 11 months before his abdication in December 1936. Canada Post owned and used the property until November 2012. Before that the lot was occupied by a hotel, a masonic lodge, and local council offices. The heritage building will be converted for commercial use, most likely a restaurant or other business that allows public access to the interior. A rooftop patio could be part of the plans if a bar or some kind of eatery does take the space. Out the front - as planned in the early stages of the project - a public gathering place with benches, trees, and planters. 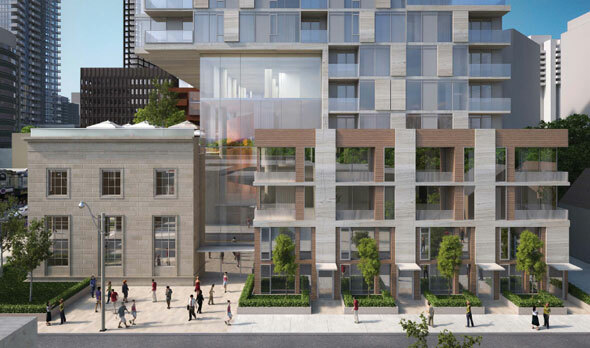 The proposed 26-storey residential tower, to be attached to the former post office via a glass atrium at the rear, will stand on a the site of a brick sorting warehouse scheduled for demolition under the proposal. 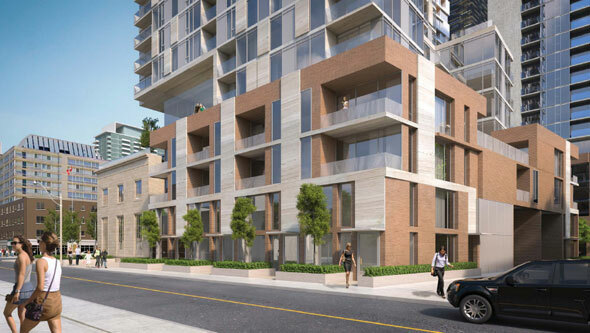 The podium area will feature a small cluster of nine townhouses; above, floors 5 through 26 will contain the remaining 225 residential units and various amenities. In total, the tower will stand 83 metres high. 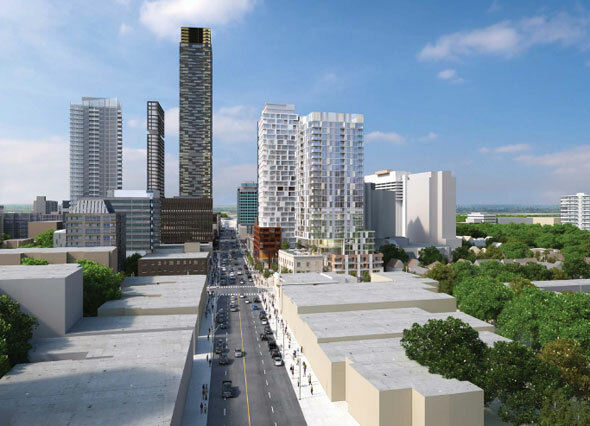 According to documents filed on behalf of the developers, the mid-rise residential component already conforms with the official plan for the Yonge-Eglinton area and therefore shouldn't face any additional re-zoning application hurdles. Official examination by the plans by the city's Design Review Panel and approval by community and city councils are still to come in the months ahead. In the meantime, what do you think of the proposal? Is this a good outcome for one of Toronto's finer examples of art deco institutional architecture? Are you pleased Postal Station K will remain publicly accessible? Total floorspace: 20,073 sq. m.
Indoor amenity space: 488 sq. m.
Outdoor amenity space: 169 m sq. m.